Four years ago when we started BeadforLife, a poverty eradication program working in Uganda, I happened upon a copy of the Fire Mountain catalogue, which contained hundreds of pages of beautiful beads of all kinds, colors, and shapes. Gems brilliant and shimmering beckoned to be bought. A friend and I commented that the catalogue was testimony to the enduring desire people have to create beauty from beads and that this was a good sign for our small grassroots effort to make the world a better place through beads. So it is really a pleasure to now share our work with all of you at Fire Mountain. 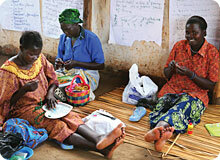 BeadforLife based its program on the belief that beads connect people, especially women, across cultures and economics. BeadforLife began with a chance encounter between a Ugandan woman, Millie, who was rolling beads near her mud home, and our founders, Torkin Wakefield, Ginny Jordan, and Devin Hibbard. Stopping to admire the beads, we learned that there was no market for her jewelry, and that Millie worked for a dollar a day in a rock quarry crushing stones in the hot sun. We all admired her paper beads and bought a few, never realizing that our lives, and the lives of so many impoverished Ugandans, were about to change. When friends at home admired the beads, we realized that there might be a market after all. I returned to Uganda, and Devin and Ginny began to develop a marketing strategy. 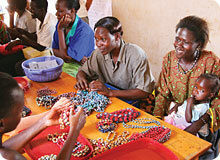 In Uganda, I held classes to improve the quality of the beads and develop several styles of necklaces and bracelets. Soon women in the US began to hear the stories of the beaders and buy their beautiful jewelry. In September of 2004, all three founders launched BeadforLife in the belief that we could build bridges of understanding and commerce. Little did we know what an amazing endeavor was being born. Our beaders are primarily impoverished women, living on less than a dollar a day, who are hardworking, intelligent, and strong in their desire to improve their lives. They make gorgeous handcrafted paper beads from recycled paper and turn them into necklaces, bracelets, and earrings. Because the beaders use recycled, colorful paper, the beads help prevent environmental degradation. What was trash becomes beauty, money, food, and hope. Our goal is for these women to be independent of BeadforLife within 27 months by being able to support themselves within the Ugandan economy. To assist them in launching their own small businesses or in creating new revenue streams, we provide entrepreneurial training, facilitate savings accounts, and make business funds available. In addition to buying and selling the beads, BeadforLife invests all of our net profits in Community Development projects in health, vocational training for impoverished youth, affordable housing and business development. The beads are sold in North America and beyond by volunteer hostesses who have BeadParties in their homes, offices, schools, churches, and communities. BeadforLife will send a hostess everything she needs to have a terrific party including hundreds of items, DVDs, CDs, recipes, biographies of Beaders. The hostesses invite their friends, neighbors, coworkers, and family and have a terrific time. 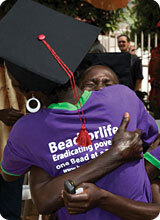 At the end of the party, any remaining beads, money and materials are returned to BeadforLife. A circle of compassion and action, which we call the BeadCircle, is growing amongst people who want to make the world a bit better. It is comprised of all the people who make the beads, those that buy beads, the people who wear our beads, all of the hostesses, and everyone else who volunteers and works with us. It is a movement of women who want to eradicate extreme poverty. BeadParties are fun and easy. Especially for all of us who already love beads. It is really our pleasure to share our work with Fire Mountain. Enjoy the video (above) which brings both the beaders and how to roll a bead right to you. 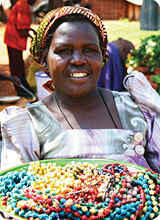 For more information on BeadforLife visit the website at www.beadforlife.org.